As of today, I have honey in jars, yellow squash relish in jars, and sweet pickle relish in jars. I even used the Periscope app to broadcast my canning adventures although I think only 1 or 2 people saw me… I still think it’s a great way to share activities and I see great things for the future of the app. If I could just find the right people to follow… oh, well… different topic! Our weather went from sweating to freezing… ok, from sweating to chilly… there was rain down here and snow falling on Powder River Pass… it acts like an early fall! I’ve been thinking I’ll spend another night outside, but so far… I’ve been too much of a sissy to do that! Perhaps a night in my studio with the windows open???? Would that count??? Had to share these composites from the other morning… We don’t usually have morning rainbows, so I was peeking through my windows and saw the main rainbow growing… barefoot and in my pj’s, I went out and had to go farther and farther out in the field to get this shot! Walking through an alfalfa field barefoot is a tricky maneuver. 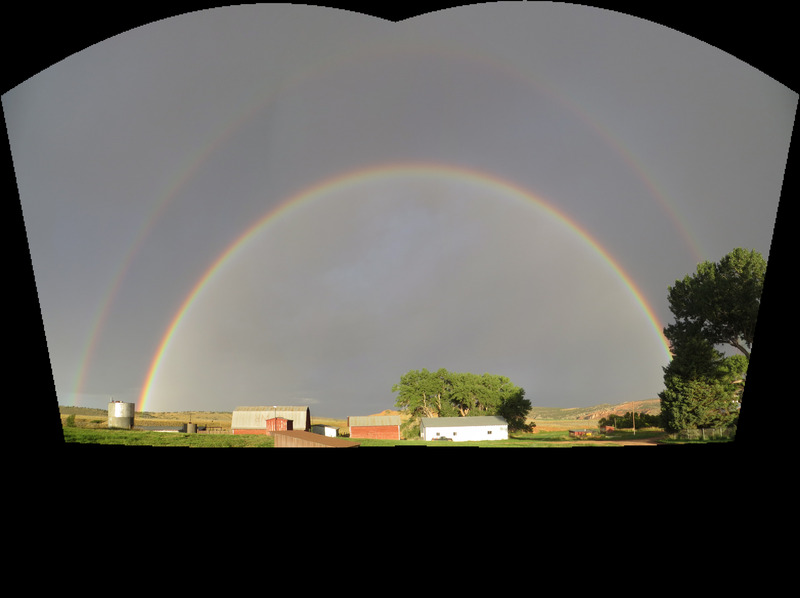 The double rainbow was spectacular, and neither panorama does it justice. I wish I’d jumped in the Rhino and driven farther away to get the entire place in a good shot, but it didn’t last that long, and I wasn’t going to miss my chance! Double click on the images to see them larger. Wow! a double rainbow!! I’ve only seen one of these once in my life, on a trip along the St. Lawrence River in northern N.Y. Unforgettable and doubly awesome. more great photos of your lovely country. Thanks for sharing. I was at NCW summers of 79, 81, 82. That corner of the world tugs at me still. Fleeting moments of incredible beauty. If they were more common, we would not view them with such amazement. Amazing rainbow Carol. Cool here too. Some trees already turning into Autumn colours. That’s a winner… amazing ….